Does anyone know if it's legal to run a bike in Ohio with historic plates outside of a parade, show/event? I need to register my '71 CL350 and the one time registration (and badass white and black plate) are too good to pass up. The Ohio BMV site says that in order to qualify for one the bike must be not used for "general transportation." I guess my question is, wtf does "general transportation mean? Can I ride it wherever so long as its not my daily driver, or will I get a ticket for riding to the movies? I've seen answers both way on other sites but not from anyone who actually does it with a motorcycle (most of them are old cars), nor from anyone whose ever talked with an official. Any buckeye DTTers have experience with this? My father-in-law had four old Indians, each registered w/ a year appropriate vintage plate and one of the brother-in-laws has old vehicles w/ vintage plates. Neither of them had any problems w/ the authorities. Admittedly, their vehicles weren't used in any kind of a daily commute, but they've been ignored and never hassled about the vintage vehicle thing. "Cruising" is big in Ohio so I really don't think you'd have a problem going to the store, to the movies, or just "Cruising." My step son is a Sergeant with the Highway Patrol and he's told me things like that are the last thing in his mind when he's out and about. From a personal standpoint, I'll be running a '59 motorcycle plate on my '59 three-wheeler, but probably won't use one on my 360 as it'll be closer to a daily rider than the '59 will. Thanks for the replies, everyone. It's comforting to hear other people put them on bikes and don't get hassled. FTR, I'm going to try and get a new historic plate, not run a YOM. I think you can run a YOM if you get a new historic plate, you just have to make sure the plates are linked and you carry it with you at all times. On one of his Indians my Father-in-law had a custom made plate, brand new, made to look like an original Ohio 1938 motorcycle plate. I think the plate number he ordered was "38FOUR" or something like that and there was no question or argument when he did the registration at BMV. I see this post is over 5 years old. I have 4 historic motorcycles and one I have yet to tag. 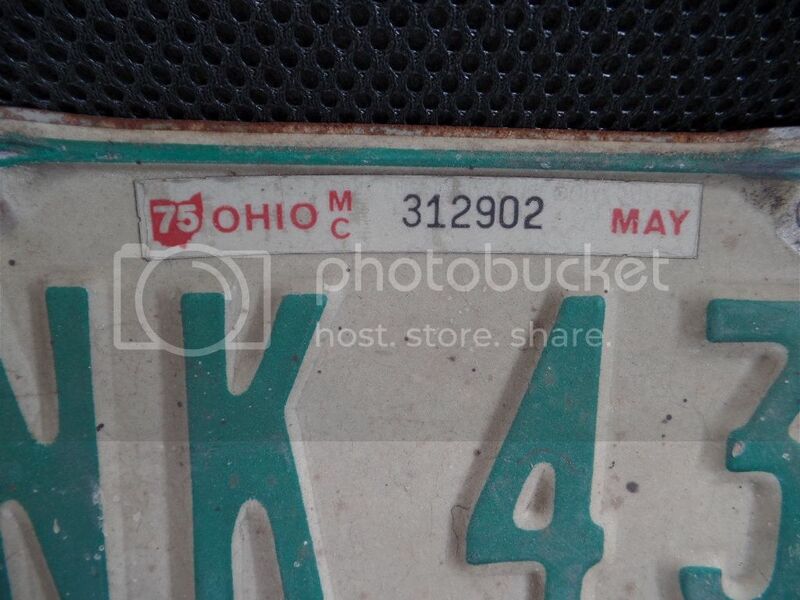 I have been looking for a old 1975 Ohio MC tag. I see reading this post I can just make one and use it. I have my 1946 Indian with it's Original 46 Oh. tag and since than I have wanted to stay with the tag of it's year. Old Posts never die, they just wait on new readers! You have to check w/ your local BMV, but I believe that is correct. 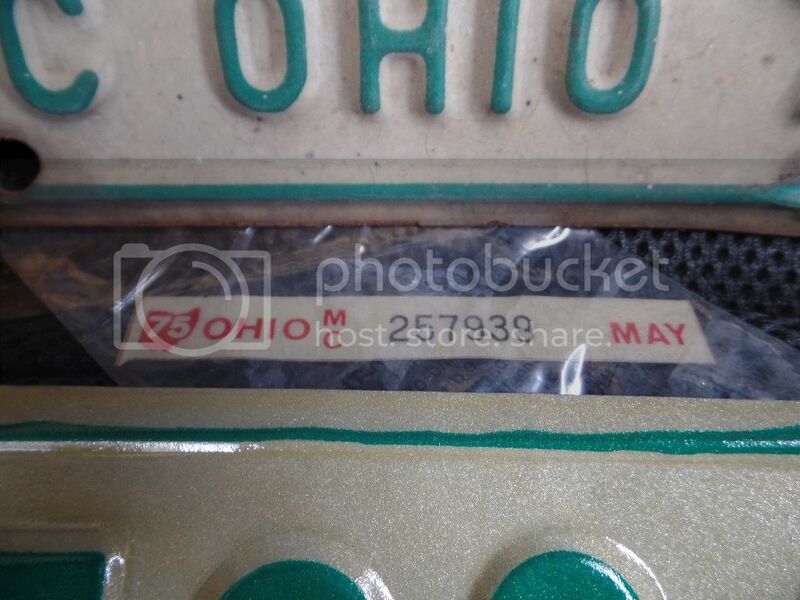 Here's a little-known thing about Ohio & '74 - '75 MC tags. It seems that they didn't make tags in '75, they used the '74 plates and there was a '75 sticker that was added. I had been looking for a '75 Ohio MC plate for a while and then discovered that my wife had one, still new and in the manila envelope, in a box of stuff. So, when I get my '75 back on the road again I'm going to use it to plate the thing. If you'd like a pix of the '75 sticker let me know and I'll take one and put it up. I would like that pic thanks!! Good to know about 75's I guess that why I have not turn up one, two years and counting. Understand I still took the 75 out it just had the 74's tag. I have two. The newer one is not used and still has the sticker in the package. That's probably the one that'll end up on my 360. The other one is a bit used... it came off a '72 350 I got to part-out. 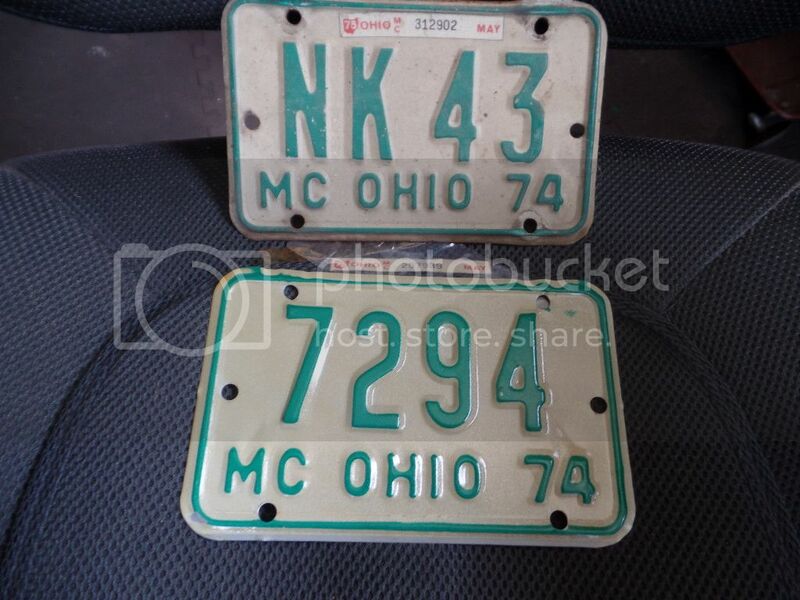 I looked and looked and was getting frustrated that I couldn't find a '75 Ohio MC plate. I don''t remember where I finally found some kind of write-up that filled in the blanks. That's an interesting bit of trivia, ridesolo. Since posting this I've run historical plates on several motorcycles without a problem. I also started collecting YOM plates, but I'm going back in time through the 60s and 50s rather than forward. Plates got boring in the 70s when they started using only white backgrounds.